This article will cover the ins and outs of your RTW Gig bag as a traveling musician. Now, keep in mind that this list is directed towards a guitarist or other stringed-instrumentalist. I will assume ahead of time that you’re not carrying a piano on your backpacking trip through Europe. If you need a full list of items to bring along on your RTW trip other than music equipment, be sure to check out the regular ol’ World Travel Packing List which covers everything from toothpaste to electronic equipment. I’ll start this list with a recommendation for a guitar. 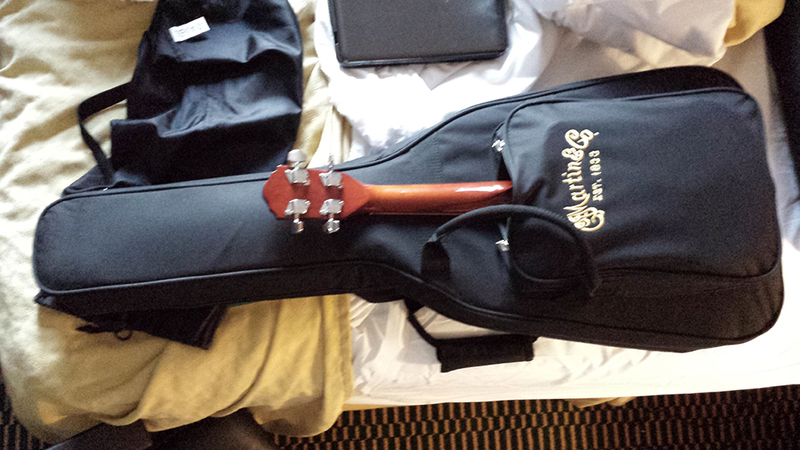 I carry the Martin LXM Travel-sized guitar. That little guy has served me well throughout four continents and has been dropped, rained on, thrown into bus storage, spent days in the sun during long hikes, and even survived being ravaged by a drunken Spanish guy in Barcelona. The sound is phenomenal for a little guitar and it’s very light. It comes with a padded gig bag which I also use to carry a small ukulele. String Winder/Cutter- The cutter is the important part there. Just imagine me trying to cut strings with a pocket knife or bending them back and forth 1,000 freaking times to try to break them at the tuning keys. Trust me, it’s worth the minuscule amount of weight. Small Egg Shakers & Foot Tambourine- For busking, or fun with new friends! Notepad and Pens/Pencils– For writing down song lyrics, set lists, or tabs. HD Camera of Some Kind- Preferably at least two. Now when I say HD Camera, I’m also including modern smartphones. I used an Apple iPhone 4s and a Samsung Galaxy S4 for video last time I was traveling. This time I’m using both of them as well as a GoPro HERO 3+ and a Sony NEX-6 Camera, depending on each situation. Small Handheld Recorder- I use a Zoom H1 portable digital recorder. This way I record a high-quality audio track along with the different video clips, and then later edit them together and sync it with the audio. Wind Muff- For the audio recorder. I’d recommend a high-quality muff rather than a traditional foam “windscreen.” A wind muff looks like a Furby. It’s a furry little cover that slips over the mic. This is the same kind, albeit on a much smaller scale, that is used for recording audio in movies. It’s much better than a windscreen for recording. If you’re wondering about storing or carrying your guitar with you as you travel, make sure to check out my Guide For Traveling With a Guitar in Europe. I’ll be uploading a few more guides for Southeast Asia and Australia/New Zealand soon! Do you have any other suggestions for this list or any additional questions? Leave them in the comment section below! I roll my clothes too! Maybe you can codinser using washable cloth bags for separating clean clothes, they can be washed and dried together with the clothes. Somehow, it just feels cleaner.DoRiS recently posted..